I am trying to dynamically load a ton of controls based on the value of a dropdown and I do not want to load them in via PHP because the initial page load takes well over 15 seconds. I have a lot of controls. So what exactly are the requirements for instantiating settings and (custom) controls via JS? Can I register the settings in PHP (this is what I've done) and then instantiate the controls via JS later or do I also need to instantiate the settings in JS? What about the JS? Do I need to repeat my markup code in the JS instantiation? In the first example for Customize Posts CSS this actually uses a new Code Editor control that is brand new in WordPress 4.9. You can refer to this pull request to see what is required. In particular, make sure you call $wp_customize->register_control_type( 'My_Custom_Control' ) to ensure the content template is actually output. When you are dynamically creating settings on the client, then you should instantiate them first in JS before you instantiate their related controls. Note that the APIs for instantiating settings and controls will be getting better in core. 1- How is the value being passed into the field/saved when there is no data-customize-setting-link? Is that handled by JS content_template? You can see from core that the data-customize-setting-link is just a shortcut to do that automatically for you. Yes, you define other non-default keys. There are some key improvements coming in WordPress 4.9 to how this all works which will make it much easier to instantiate controls with JS. In addition to a data-customize-setting-link attribute there is now support for a data-customize-setting-key-link attribute, which allows you to use the actual key in the template as opposed to the setting ID. In addition, the settings you pass can reference either setting IDs, or Setting objects, or even just arbitrary Value instances. title: 'blogname', // Setting ID which may not be registered yet. tagline: api( 'blogdescription' ), // Existing registered Setting object. founded: foundedValue // Non-setting Value. The founded year being a Value is just for demonstration purposes. It being a Value and not a registered Setting means that it would not be saved in the database. But a Value like this could be useful for meta controls in a given theme, like picking from among preset color schemes. 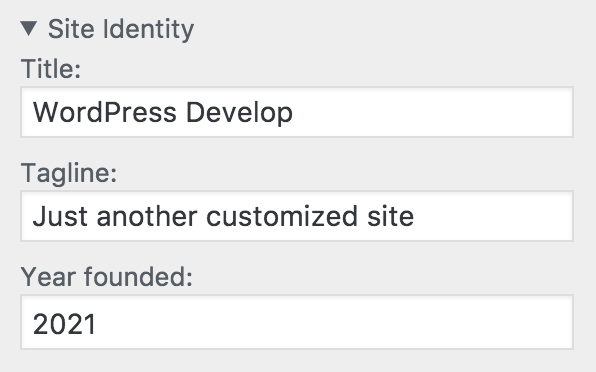 This is also how the changeset status and date get populated in WordPress 4.9. Please watch make.wordpress.org/core for a dev note that dives into all of the specific improvements to the JS APIs in WordPress 4.9. How do I add a customizer control dynamically? Why is remove_setting and remove_control not working?